Comets, asteroids, and meteoroids - defining the true difference between these three celestial bodies is still puzzling to this day for many. The main traits that separate each object is that asteroids are large enough to be considered minor planets (orbiting the Sun) whilst meteoroids can be as small as one meter in diameter and drift through space in elliptic orbits around the Sun - they are known as meteors or shooting stars when they enter Earth's atmosphere and vaporise, visible as a white streak of light in the night sky; interestingly, meteor is only the term used for the light visible in such an event, not when referring to the rock itself. Comets, on the other hand, are large, icy chunks of rock that have enormous orbits of their own - some can pass through the Solar System every couple of hundred years, some every few thousand, and some speculated to be every several million years or so. Of course only existing in sketches and texts, The Great Comet of 1811 is also without a fancy title - maybe because Honoré Flaugergues, it's discoverer, doesn't have the easiest to pronounce of surnames. Whatever. It was discovered of March that year whilst it was drifting around 251 million miles away from the Sun - in the former constellation of Argo Navis, which has now been divided into three separate constellations and whose many stars are no longer visible due to changes in Earth's axis over time. In the build up to it's September 1811 perihelion, the comet's visibility varied due to it's altitude and varying evening lighting conditions. But once it's perihelion did arrive, it was documented as amazing sight, illuminating the sky for around 260 days; a record held until the appearance of Comet Hale-Bopp in 1997. 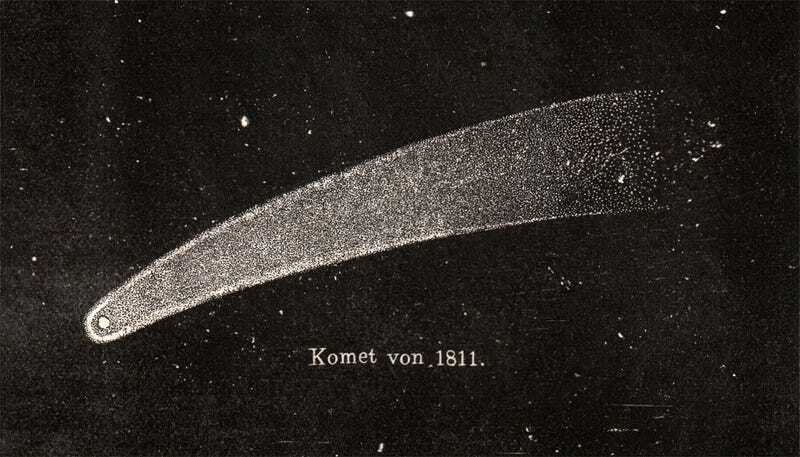 Brightness aside, one of the most notable traits of the 1811 Comet was it's size - the nucleus was 18-24 miles across supposedly, but it's coma was thought to have been over 1 million miles across; notably larger than the Sun. Holy gravy. It's orbital period has been calculated at around 3000 years or so, but an exact return date or even rough estimate in terms of what year isn't truly known due to the little understanding we have of it's orbital patterns. Based on this data alone, it of course won't return until the year 4800; none of us alive today will get to see just how amazing it truly was. 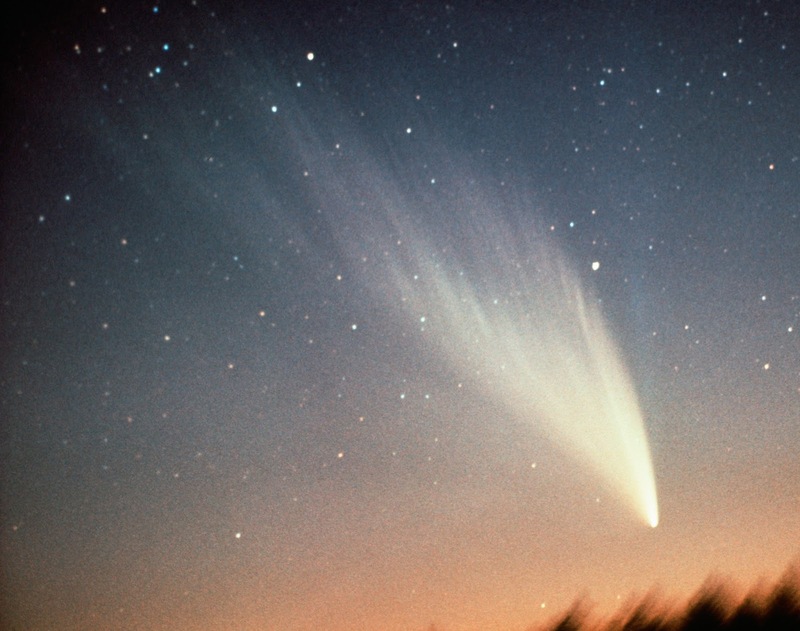 Quite possibly one of the brightest documented comets in human history, and certainly the brightest of the 20th century, this comet was also dubbed the Daylight Comet for reasons that may seem fairly obvious by now. It was discovered in January 1910 (orly?) by many observers, though various disputes arose as to who truly discovered it first, and no specific person is really credited with such an accolade. The comet brightened at a sudden rate and entered it's full perihelion by January 17 - at nightfall, it outshone Venus which, aside from the full Moon, is otherwise the brightest object in the night sky. It was also easily visible during the day to the unaided eye; something that has seldom been a trait of many of even the brightest of the great comets since. Little was documented regarding it's potential size or tail length, and while it's orbital period was roughly estimated at around 60,000 years, an estimated return date can never be predicted due to potential shifts in orbital patterns over such a large timeframe. Then again, with an orbital length like that, I suppose nobody really cares about such a thing. Interestingly, 1910 was also the year Halley's Comet made it's return (as predicted), having previously flown through the Solar System in 1835. As a result, the Daylight Comet was often mistaken for Halley at first glance, and came as shock to many people due to it's incredible brightness and dramatic tail curvature in February, following it's perihelion. However, Halley eventually made it's return in April, by which time the Daylight Comet had faded from view and was long gone. As previously said, while it isn't one of the most documented ones of all time, it holds the record for being one of the brightest ever studied; one has to admire the beauty that can be generated in the skies by what is essentially an icy chunk of rock floating through space. Named after it's discoverers Alan Hale and Thomas Bopp, Comet Hale-Bopp is quite possibly the most renowned comet in recent history, and undeniably the most widely observed. It was discovered in 1995 at a distance of some 670 million miles (7.2 AU) from the Sun; Hale and Bopp had spent much of their time searching for comets with little success, but shortly after forwarding their discovery to Central Burea of Astronomical Telegrams, it was confirmed that their findings were that of a new comet. The nucleus itself is between 25-50 miles in diameter and, much as with the 1811 Comet, Hale-Bopp also had an enormous coma: believed to be around 3.5 million miles in diameter, with a sodium tail that stretched for just over 30 million miles. Such a size and eventual brightness as it heated up on approach made it visible to the naked eye by May 1996, and it's full perihelion began on April 1, 1997 - it's magnificent presence in the night sky lasted for a for a record 18 months, easily surpassing the 260 day record previously held by the 1811 Comet. Even the most heavily light polluted skies could not obstruct it from general viewing; every single star except Sirius was dimmer, and it could be seen long before the sky even got pitch black. Hale-Bopp was no longer visible to the naked from December 1997 onward - it's orbital period is calculated at around 2500 years, and so it is predicted to return around the year 4300 or so. A shame for the those who missed it, including myself (I was 2 years old, so I don't remember even if my parents did show me), but it lives on as an amazing part of history. Perhaps one of, if not the most well known comet of all time, Halley's Comet, unlike our previous examples, is a short period comet - appearing every 70-75 years instead of every god knows how many thousand. It is also rather small compared to our previous case studies, with it's nucleus reaching around 5-10 miles in diameter and the coma around 60,000 miles in diameter. As for it's tail, well, that leans much more toward the impressive side - potentially stretching for over 60 million miles, an iconic trait that boils down to solar wind interacting with the ionized particles within the comet's coma. Whatever that means. Due to it's high frequency of visits to the Solar System compared to most comets, Halley has been observed by astronomers for thousands of years, with confirmed documented sightings dating back to the 2nd century. It appeared in England during 1066 and is famously recorded on the Bayeux Tapestry, considered an omen that had an influence on the well known Battle of Hastings. With each return, Halley continued to amaze all those who witnessed it, and many historic images have been preserved over the past hundreds of years as it returned to our Solar System every seven decades. The comet received it's name in 1705 after Edmond Halley, who finally calculated it's periodicity and orbital patterns - a significant discovery for future research. Nucleus of Halley, taken by the Giotto probe in 1986. 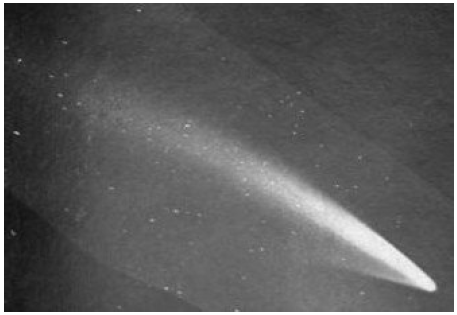 However, it wasn't until it's 1910 approach that the first photographs of the comet could finally be taken - giving us a better look at it's presence against the night sky, even if the technology to take such images was still limited at the time. This was the also one of the closest approaches Halley had ever made, being just 13 million miles or so from Earth, and thus was an incredible sight that required no visual aid to behold. In stark contrast, it's 1986 appearance was considered one of the worst, due to increased light pollution and the fact that the comet and Earth were on opposite sides of the Sun when it entered the Solar System - it's closest approach was 39 million miles away, making it extremely difficult to see in urban locations without the aid of binoculars or telescopes. However, due to the evolution of space travel, the first closeup photos of it's nucleus were captured by the Giotto probe - allowing us to gain a stronger understanding of the compounds within it and it's overall measurements. With all this in mind, 1986, while a poor year for general viewing, is certainly one of the best for scientific achievements. Halley will return to us in summer 2061, and is expected to be on the same side of the Sun as Earth this time, creating better viewing conditions. I'll be 66 years old, so assuming nothing goes horribly wrong between now and then, I'll be able to see it - uber hyped without a doubt.